Following years of floundering with their live-action features, with films like The Sorcerer's Apprentice, Race to Witch Mountain and John Carter, Disney has finally realised where their strengths lie of late by adapting their most popular animated classics into live-action cinematic spectaculars. 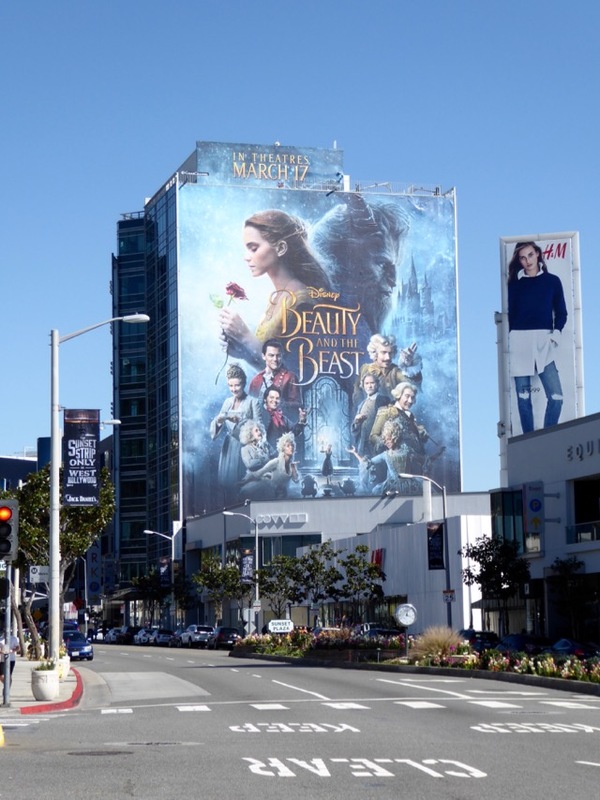 Their latest big screen offering is a tale as old as time, reimagined and brought to life by Bill Condon, with Harry Potter's Emma Watson as 'Belle' who sees past the beastly appearance of Downton Abbey's Dan Stevens enchanted prince. 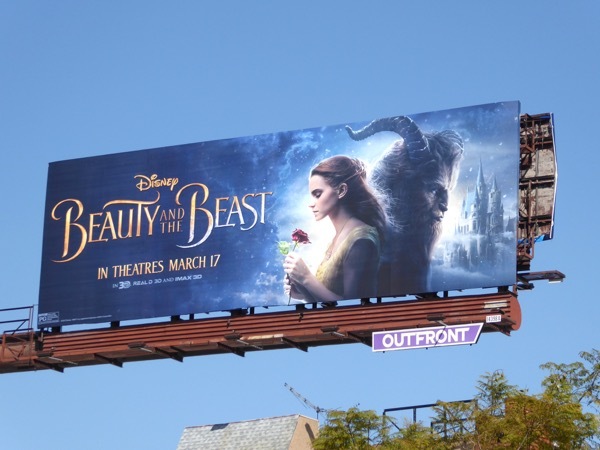 The magical musical also stars the voice and human talents of Ewan McGregor as cursed candelabra 'Lumière', Ian McKellen as the ornate timepiece 'Cogsworth', Emma Thompson as the teapot 'Mrs. 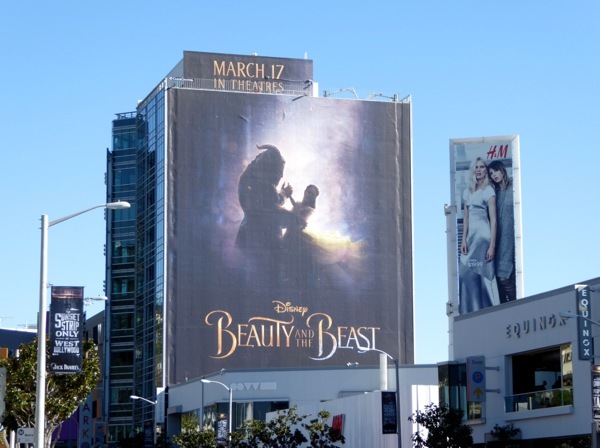 Potts', Gugu Mbatha-Raw as feather duster 'Plumette' and Luke Evans as the dashing 'Gaston' to name but a few. 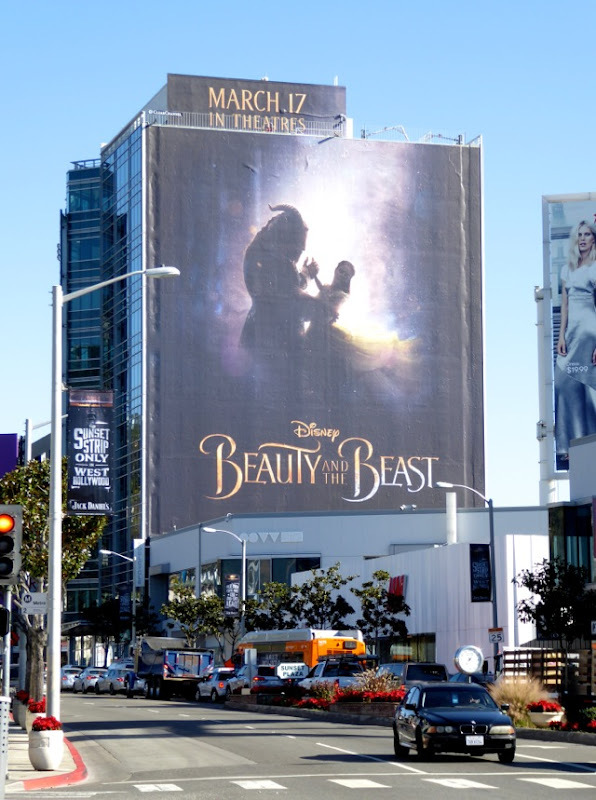 This giant-sized Beauty and the Beast billboard dancing elegantly across the skies of the Sunset Strip was photographed on December 28, 2016, whilst the standard landscape version was spied along Santa Monica Boulevard further west the next day. 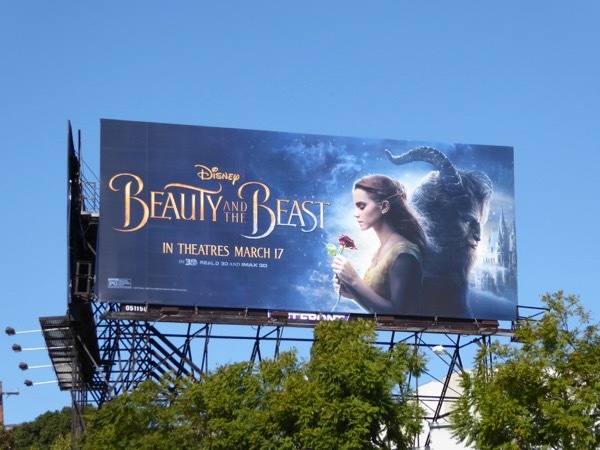 If you're a Disney fan, make sure you also check out these other live-action adaptation ad creatives, like these movie billboards for The Jungle Book, these Cinderella movie billboards and these Maleficent movie billboards (inspired by the Sleeping Beauty story). 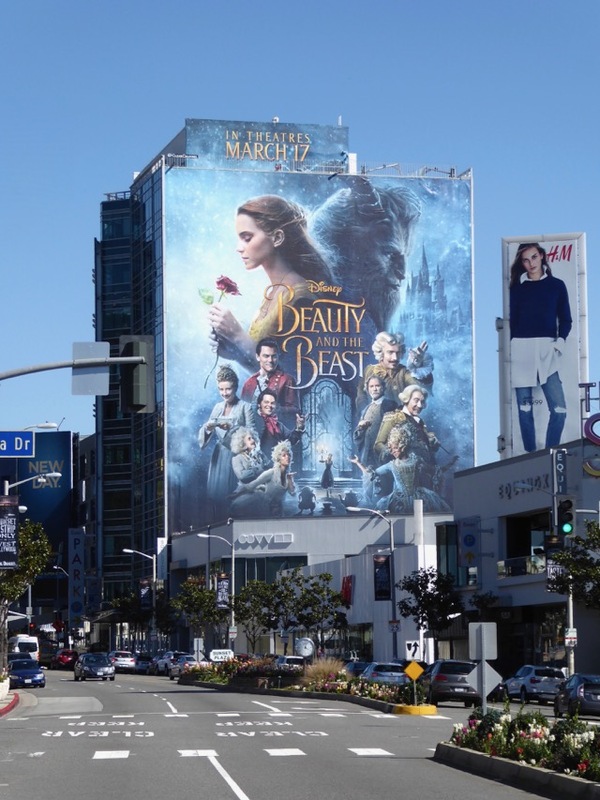 Meanwhile fans of this movie will also want to check out all these movie costumes from Disney's live-action Beauty and the Beast, including Emma Watson and Dan Stevens fabulous looks, on display. 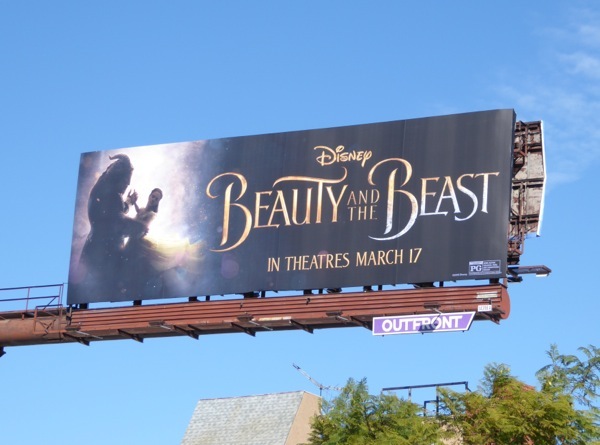 If you're looking for a romantic fairytale to lift your spirits this year, it looks like Beauty and the Beast may be the magical movie experience you'll be spellbound by. 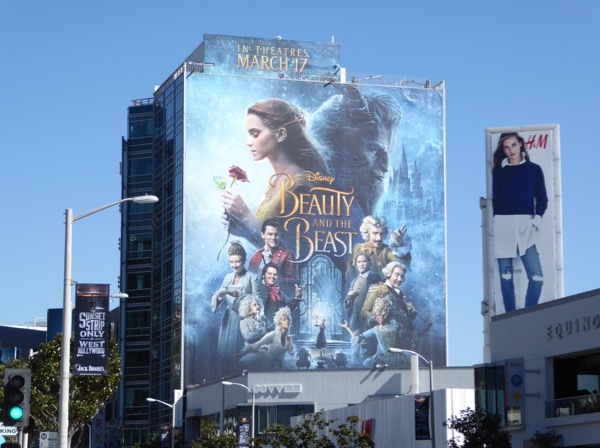 UPDATED: After being teased with those dreamy ballroom ad creatives, here's another billboard for the theatrical release featuring the wider human cast of film. 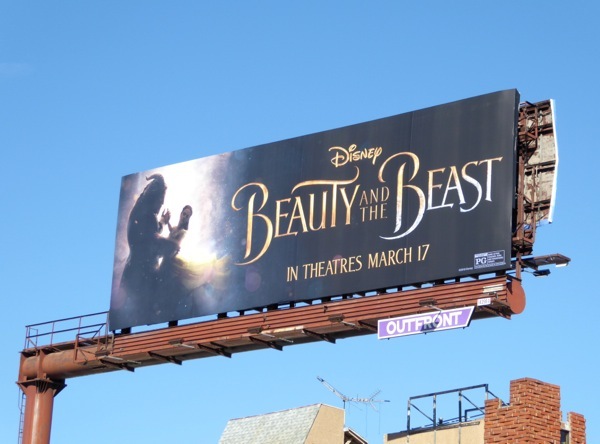 This magical giant-sized Disney billboard was snapped along the Sunset Strip on February 12, 2017. Let's see if this live-action version can capture imaginations and hearts this March in the same way as the animated classic did all those years ago. 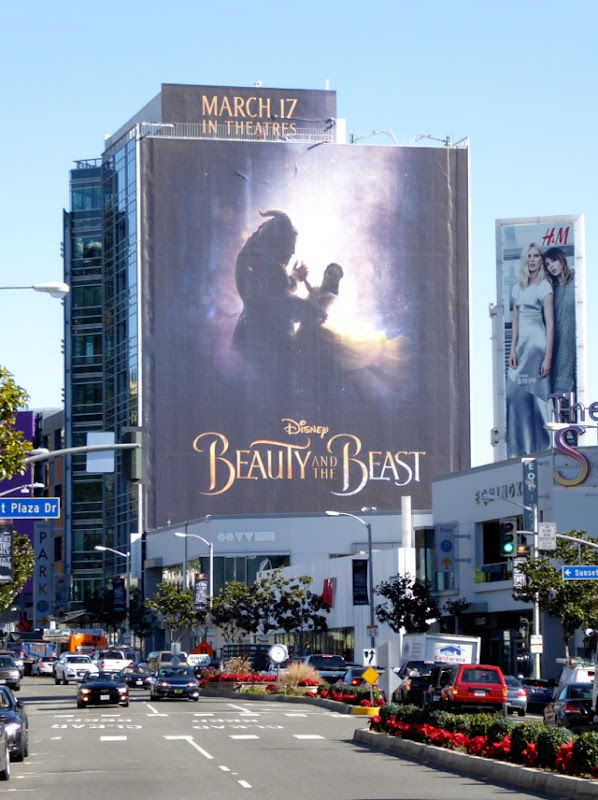 Plus here's also a landscape version of this romantic ad creative with just Belle and the Beast. 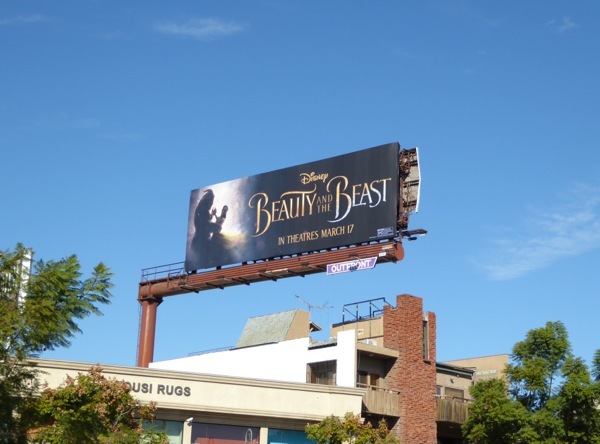 This billboard was photographed above Santa Monica Boulevard on the Westside on Valentine's Day. 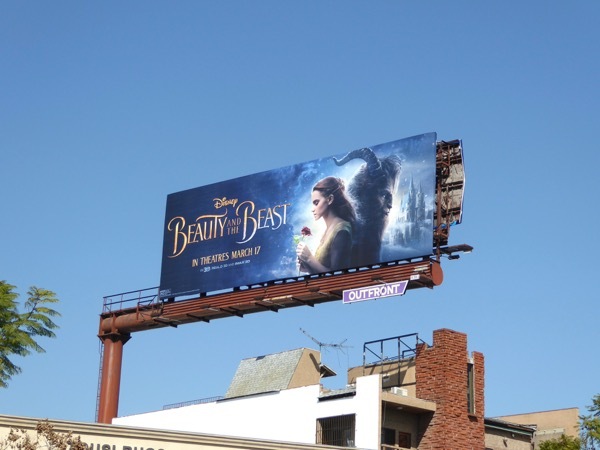 UPDATED: Here's another billboard for the movie adaptation spied along Santa Monica Boulevard in West Hollywood on February 23, 2017.